(BEAVER FALLS, Pa.) –Geneva College has received the theological library and papers of Dr. John H. Gerstner, renowned American theologian and a leading scholar on the work of Jonathan Edwards. The Gerstner family donated Dr. Gerstner’s collection of works, now located in the McCartney Library on Geneva’s campus. The College will dedicate the Gerstner collection on Friday, May 10, 2019. In conjunction with Geneva’s 2019 Commencement Weekend, the dedication events include a Gerstner Symposium at 9 a.m., a formal Dedication Ceremony at 11:15 a.m., and a Luncheon at 12:30 p.m.
John H. Gerstner earned his Master of Divinity degree and Master of Theology degree from Westminster Theological Seminary, and his Doctor of Philosophy from Harvard University, in 1945. He taught church history for over 30 years at both the Pittsburgh Theological Seminary and Knox Theological Seminary. 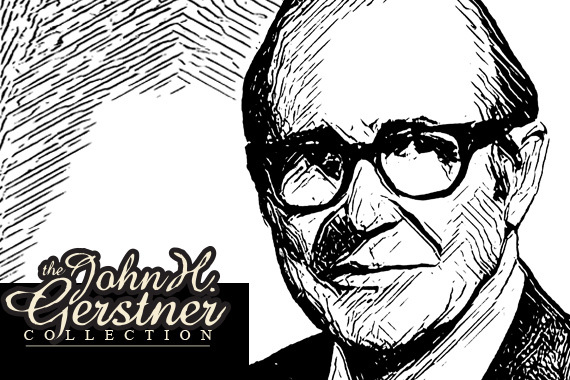 Dr. Gerstner had a profound influence on churches and organizations nationwide through his teaching, writing and preaching. Studying and working at both Harvard and Yale, he focused much of his research on the life and theology of Jonathan Edwards. His influence reached many of his students, one of whom was R.C. Sproul, founder of Ligonier Ministries. Dr. Barry York, President of the Reformed Presbyterian Theological Seminary in Pittsburgh, will moderate the symposium exploring the long-term significance of Dr. Gerstner’s intellectual contributions. Participants include: Dr. Art Lindsley, Vice President of Theological Initiatives at the Institute for Faith, Work and Economics, and previous Director of Education Ministries at Ligonier Valley Study Center; theologian and pastor Dr. David Coffin, who served as editor and publisher for John Gerstner's three-volume work, The Rational Biblical Theology of Jonathan Edwards; and Dr. Mark Ross, Associate Dean and Associate Professor of Systematic Theology at Erskine Theological Seminary in South Carolina and Director of the Institute of Reformed Worship. The Dedication Ceremony, which will be held on the lawn of McCartney Library at 11:15 a.m., will include remarks by President of Reformation Bible College and Chief Academic Officer of Ligonier Ministries Dr. Stephen J. Nichols, who serves as Commencement speaker the following day. Family and friends of Dr. Gerstner will share remembrances of his life and work, and Dr. John “Jack” White, Geneva College President Emeritus and a contemporary of Dr. Gerstner, will deliver a dedication message. Attendees will have opportunity to tour the Gerstner Collection in McCartney Library. The College will serve a luncheon in Alexander Dining Hall after the dedication, featuring a message for pastors by Dr. Nichols. The Gerstner Collection at Geneva College provides access to Dr. Gerstner’s theological library, his private and published writings, study notes, video and extensive resources. The College has dedicated a special room for the collection within McCartney Library, made possible by a grant from PNC Financial Services and donations from alumni and friends of the College. The collection will greatly benefit Geneva students and faculty as well as theological scholars interested in apologetics, Jonathan Edwards, and biblical inerrancy among other scholarly emphases in Dr. Gerstner’s work. To learn more about John H. Gerstner, you can read his biography, John Gerstner and the Renewal of Presbyterian and Reformed Evangelicalism in Modern America, by Jeffrey S. McDonald.